Mitsubishi’s Lancer Evolution, once a highly coveted Japanese Domestic Market only vehicle, graced North American shores in 2003. Since then the Evolution, or Evo as it is commonly called, has undergone two significant redesigns. Each generation Evo is designated by a Roman numeral. 2008 saw the debut of the 10th generation, or Evo X. Featuring a newly designed all aluminum 2.0L turbocharged engine, and Super All Wheel Control, the Evo X is capable of producing nearly 300 horsepower in stock trim. Always hungry for more power, K&N engineers took one look under the hood and decided that more could be done. That’s exactly what K&N did with Performance Air Intake System 69-6546TWR. Much consideration was put into the design of part number 69-6546TWR for the 2008 and 2009 Mitsubishi Lancer Evolution with a 2.0 liter engine. Unique features include a powder coated aluminum upper intercooler and turbo inlet tubes replacing the stock pieces for improved air delivery. 69-6546TWR incorporates a unique heat shield, which retains the use of the factory fresh air scoop. The result of this hard work and enthusiasm for performance is an incredible 21 horsepower gain at the wheels for the 2008-09 Lancer Evolution. K&N’s Research and Development Department tested a 2008 Mitsubishi Lancer Evolution 2.0L Turbo L4 on our in-house dynamometer. Results showed a shocking peak horsepower gain of 21.42 horsepower @ 6,100 RPM! 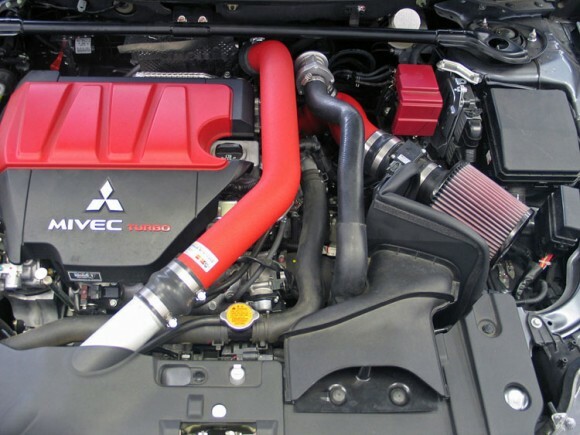 The 69-6546TWR provides improved performance with an attractive wrinkle-red powder coated aluminum intake and intercooler tubes to enhance the Evo X’s engine bay. K&N intakes are designed to dramatically reduce intake restriction as they smooth and straighten airflow. This helps to feed denser air to your engine for more power and torque when you need it. With a K&N Performance Air Intake System, you can count on extra horsepower whether enjoying a lonely country road, or competing in a Time Attack racing event. 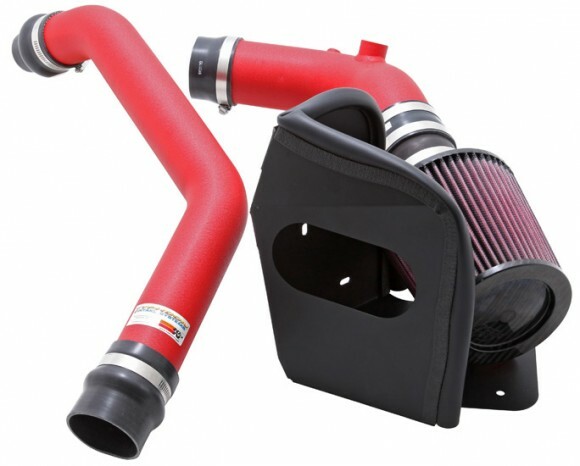 This air intake system uses a conical shaped, carbon fiber topped, high-flow air filter (RF-1047) and powder coated aluminum heat shield in place of the vehicle’s stock air box. The result is an air filter that captures harmful particles, has high air flow, and has long service life. This K&N air filter performs for up to 100,000 miles before service is required, depending on driving conditions. Improving the air path between the filter and the engine are the powder coated aluminum intake and intercooler tubes. Our powder coated aluminum tubes offer power and a stylish appearance. The 69-6546TWR takes about 90 minutes or less to install using stock mounting points. It requires no cutting or drilling and it is covered by K&N’s Million Mile Limited Warranty. APEXi continues to lead the way with innovation and experience. The latest offering from APEXi is the Power Intake for the Mistubishi Evolution X (507-M009). 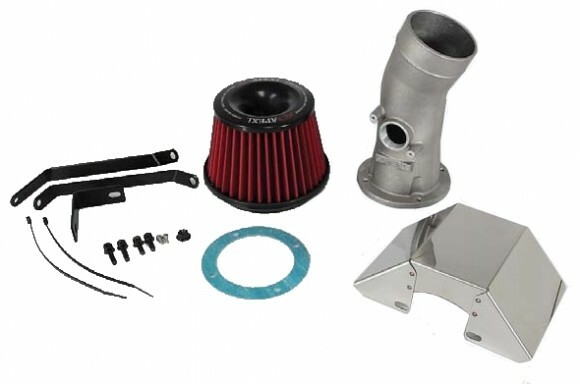 This APEXi Power Intake comes complete with Intake Filter, Piping and Heat Shield for a quick and painless bolt-on installation.